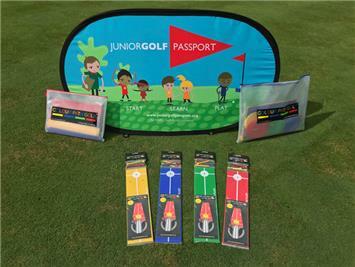 A significant additional benefit for PGA pros is available from the Golf Foundation’s association with junior golf coaching specialist Colour Path Golf - now a Junior Golf Passport Delivery Partner. Colour Path Golf is a product and concept that is proving to simplify the learning process, whilst enhancing the relationship and communication between the coach and student. Juniors enjoy the fun games that can be created by using the kit, skills challenges, puzzle building and memory game tests. The kit can be used with any age, any ability and in any aspect of the game a player wishes to work on. The most powerful thing about Colour Path Golf is how it helps players to easily remember the skills taught in a lesson just by looking at the visual road map of kit on the ground. Any club that has an active Passport license will be entitled to a 25% discount on the Colour Path Golf range. This is a simplified, versatile teaching aid that can be used by all teaching professionals; with high engagement from all students, especially kids who love the bright colours. As part of the team at Colour Path Golf’s commitment to grow the game, every product that is purchased by PGA pros who are registered on the Passport will create a small donation for the Golf Foundation (see www.colourpathgolf.co.uk).